Stone Camouflage. The grick has advantage on Dexterity (Stealth) checks made to hide in rocky terrain. Multiattack. The grick makes one attack with its tentacles. If that attack hits, the grick can make one beak attack against the same target. Tentacles. Melee Weapon Attack: +4 to hit, reach 5 ft., one target. Hit: 9 (2d6 + 2) slashing damage. Beak. Melee Weapon Attack: +4 to hit, reach 5 ft., one target. Hit: 5 (1d6 + 2) piercing damage. This wormlike monstrosity blends in with the rock of the caverns it haunts. When prey comes near, its barbed tentacles unfurl to reveal its hungry, snapping beak. 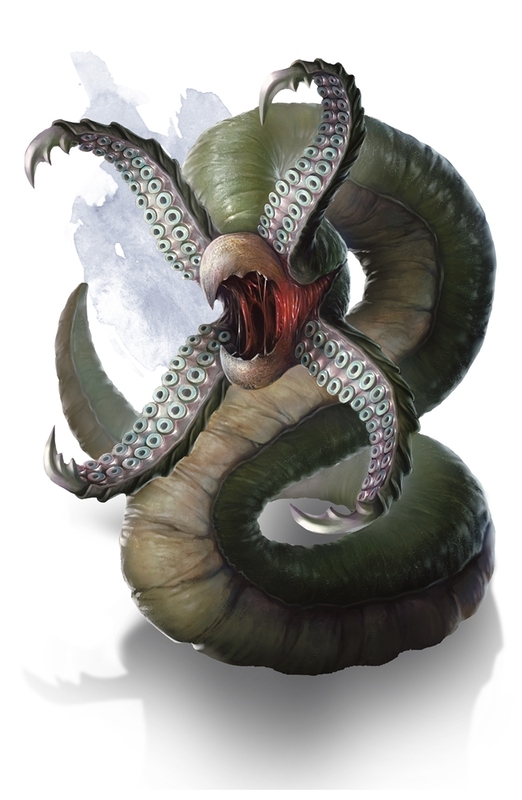 Would it be fair to say that the Grick's tentacles could act like grappling tentacles to make combat extra annoying for particularly large parties, requiring a DC14 Strength Check to overpower it and be able to break free? I think I may do that when my parties encounter this creature, since I'm running LMoP with 8 players in it, and have found I need to buff up the encounters a little to make it more of a challenge. Agreed! Good suggestion for a "natural buff" on the creature, GreyTigerFox. The description implies that its typical strategy is to grab the nearest victim it can reach and drag it off to eat alone, so I think that's a fair decision. nah, its a animal, a ferocious animal, but a animal.